We all go places each day but do we think about, let alone appreciate, the roads we travel on? I often think about traffic and potholes and the endless construction, of course. But how long have paved surfaces made our travel easier and faster? What would we do without paved roads? How did we get anywhere before them? I thought I’d take a look back to understand some history and get some perspective on how long we’ve enjoyed this paved convenience. When did pavement become part of our lives? In a global context, road development clearly pre-dates America. We often hear of the quality of Roman roads, but the NY Times claims that the world’s oldest known paved road was constructed in Egypt around 2,500 BC. 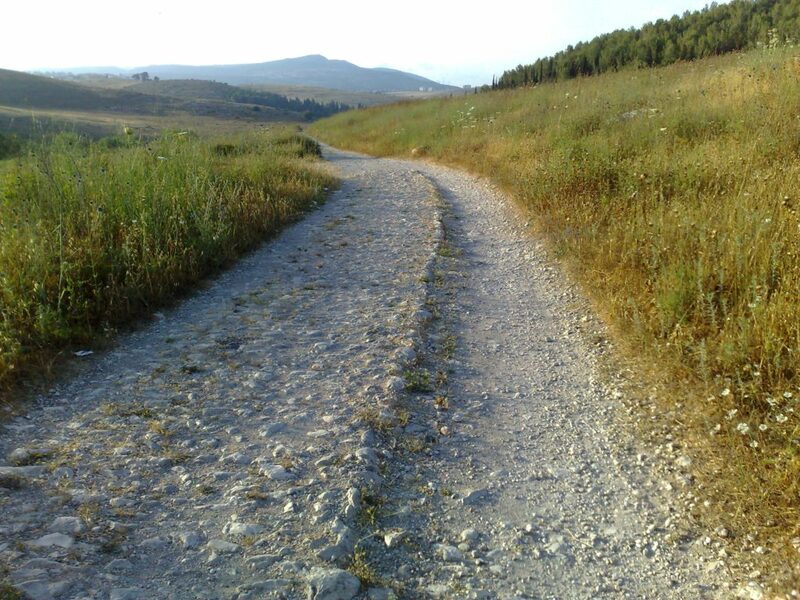 A book about the history of roads says that stone-paved streets appeared in the city of UR as far back as 4,000 BC. In the 8th century in Baghdad, they used tar from their local petroleum supplies, to pave their roads. What the Romans did have right was quantity. According to a book about the history of highways, the Romans had 29 major roads that stretched out for 78,000 kilometers or 48,500 miles. 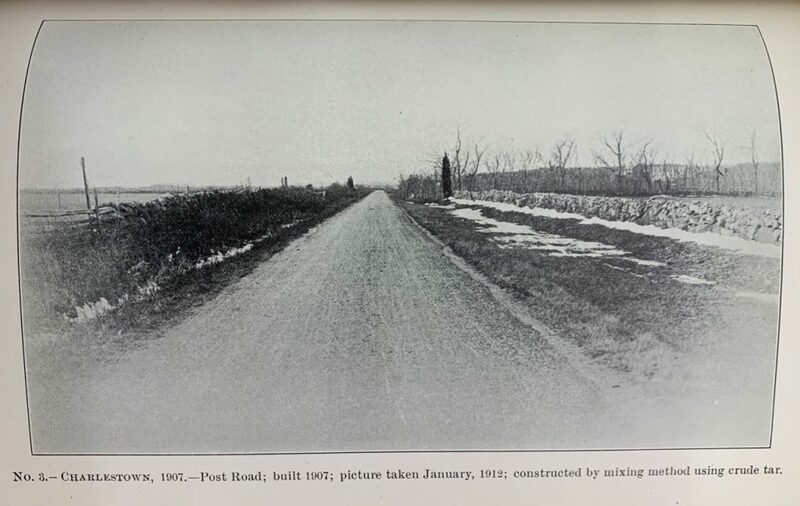 Contrast this with the 1913 annual report from the RI Department of Public Roads (RI DPR) – “At the close of the year 1912, there were 294 miles of State roads under the direct care and maintenance of the State Board…Of the above named mileage, 43 miles–standard width, 14 feet–were built during the past season…” Amazingly, the Romans had 165 times more roads to manage in 100 AD than RI had in 1913. RI and Rome do share a road design philosophy, however – and that is connectivity. It may sound a bit obvious to focus on connecting far-flung locations now, but interstate cooperation wasn’t quite as much of an accepted philosophy a hundred years ago in the U.S. when it came to roads. Rail was a much more prevalent way for people and goods to travel between major destinations. Even locally, trolley and electric street cars were the ways most people got around town. The streets were muddy and rutted. Motor cars were not yet the common appliance they are now. RI only had 3,468 vehicles registered in 1908 [1913 RI DPR annual report]. 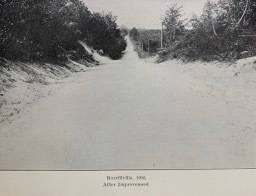 The RI Department of Public Roads was prescient to acknowledge that RI would gain many advantages by extending local thoroughfares to the borders of the state so that they would connect to its neighbors. The benefits to commerce and tourism were cited as strong motivators. But practicality and cost dictated that early “good roads” were maintained in town centers with high traffic and dense population, primarily. Less-good roads then extended between major towns and to commercial sites such as factories. Connecting cities together would come together slowly, building out from the city centers toward each other. The goals behind our major interstate highways existed but implementation was to come later. I’m not sure why, but I would have thought that creation of a full, major artery like NY to Boston would have been done first before all of these other little pieces, but that is not how things happened historically at all. From these urban and town centers, the “roads”, in many cases glorified dirt paths, stretched out to connect one to another. RI was an early adopter of the “state road” concept – where centralized management and maintenance of the most strategic route was assumed by the state rather than by each municipality. Before this change, roads were often built by private developers as “turnpikes” forcing motorists to pay local fees to gain access. England pioneered this privatization concept starting in the 1500’s but abandoned it in the 1870’s, finding it sub-optimal. Privatization did manage to get important “roads” built and maintained but motorists were often being charged substantial amounts to use them. 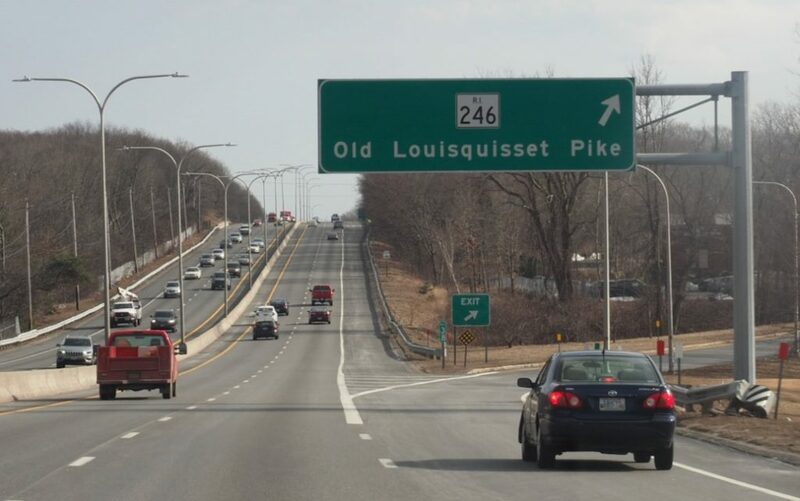 Some RI signs still show references to these old names – Louisquisset Pike, Putnam Pike, Douglas Pike, Farnum and Providence Pike. New London Turnpike (Route 3) is the only named turnpike still in use in RI, apparently [Wikipedia]. Shortly after the formation of the Department of Public Roads, it was decided to start buying back these turnpikes to convert them to state roads. 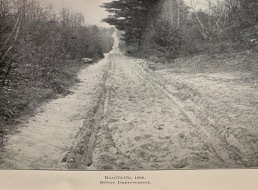 Improvement of these new “State roads”, however, appears to have happened in small sections of each road all over the state of RI and over many years. The annual reports list the often mile-long sections that were bid out to developers each year to “improve” by means of grading the surface and adding macadam (broken stone, see below) for durability. The locations of constructed sections were often reported in relative terms like ‘starting from the northern end of the macadam of the State road in [town name] and extending for 5,400 feet’. But there were standards – roads were specified to be 14 feet wide with crowning of no less than 3/4 inch over one foot and with 3 foot runoff areas on each side. Towns could opt to make some sections a bit wider in certain areas by paying for the extra themselves. In 1904, Bristol chose to create a section that was 26 feet wide and 1,789 feet long. 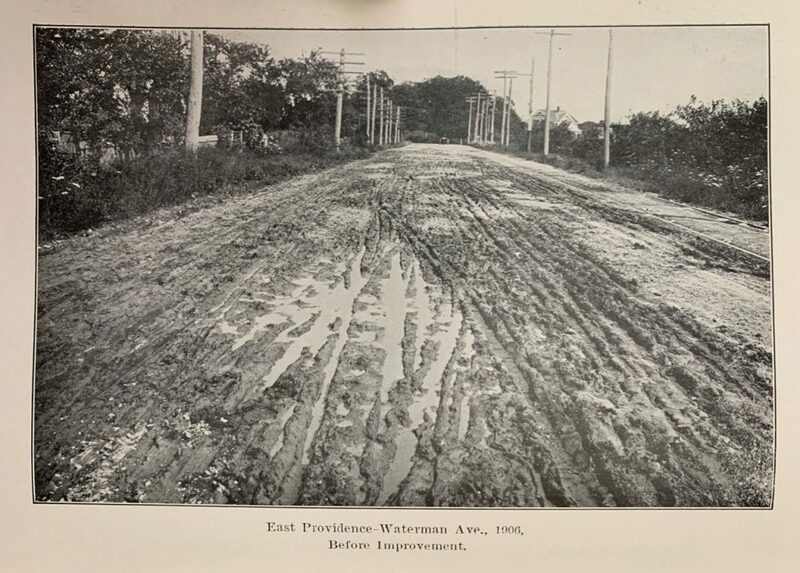 In the same year, East Providence built a section on Taunton Avenue that was 20 feet wide and 5,750 feet long from the border with MA and running west. While the ultimate goal was full connectivity, improvements were made very incrementally and often in isolation from other “improved” sections. Long-distance travel by car must have been quite complicated and full of unknowns. The process of laying the stone out in courses that were steamrolled to compact them proved to be far more durable than the dirt/mud roads that existed prior. But these “macadam” surfaces still required quite a bit of maintenance each year to maintain their quality, especially as the use of cars increased as did their speeds. Durability was certainly a main concern but another concern is less obvious to us now – dust. The clouds of dust generated by passing vehicles were recognized early on as both a visual nuisance and a local health threat. The RI Road Department sought a way to achieve both durability and effective dust control without adding to the overall cost of the project significantly. Tar + macadam = tarmacadam or “tarmac” as it is better known – a combination of a petroleum substance and a man from Scotland. Who knew? 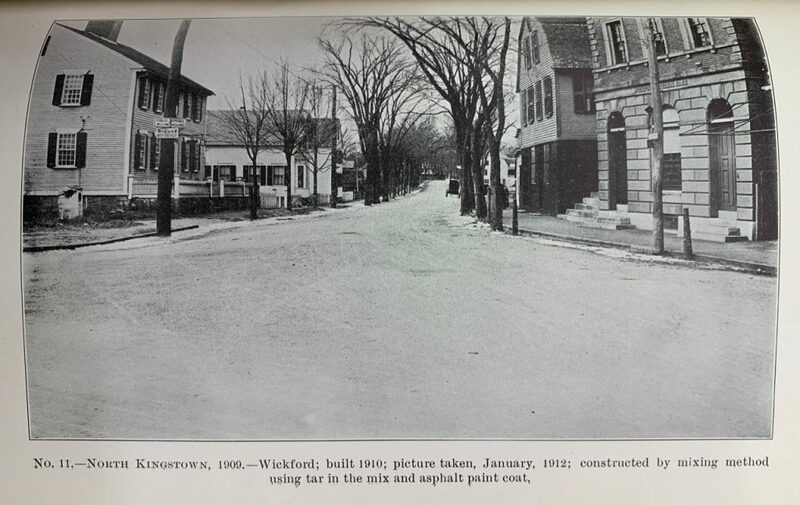 Rhode Island’s careful and considered approach to verifying a better road surface has earned its place in history, surprising perhaps given that tar-based roads were possibly as old as the 8th century in Baghdad or at least 1824 in Europe. “One of the first “tar” roads was laid in Paris. The famous Champs-Elysees of the 1600s was covered with asphalt in 1824 signifying it as the first modern road in Europe. By the late 1800s, America would be paving roads. One of the first was Pennsylvania Avenue in Washington D.C.” [ref.] For us here in RI, the local solution, as usual, appears to have been found…right near the beach. When thinking of road history, we may quaintly think of a few sputtering Model T’s delivering glass milk bottles down rutted dirt paths, but in 1918, an article by highway engineer Andrew F. Anderson reported that “4,983,340 motor cars, including commercial vehicles, and 257,522 motorcycles were registered in 1917. In fact, the United States had an estimated 85 percent of the world’s motor cars.” And the total was growing at over 40% annually. Interestingly, Bloombery Businessweek just predicted that we have just reached “Peak Car”, the most that will exist, at 1.3 billion cars in 2019. But 5 million cars on U.S. roads in 1918 is surprising to me. From the annual reports, RI was already noting that maintenance was an issue. I didn’t realize that a huge amount of our current interstate highway system was built in a very short span of time. The U.S. Department of Transportation (DOT) was not established until 1966, with the Federal Highway Administration sitting inside of it. In the following two decades they opened “99 percent of the designated 42,800 miles of the Dwight D. Eisenhower National System of Interstate and Defense Highways” [ref.]. Nearly the whole thing happened between 1967 and 1987! Our ability to travel quickly and in (relative) comfort from coast to coast didn’t occur until 1913 with the creation of the Lincoln Highway from Times Square in NYC to Lincoln Park in San Francisco. Could this development be the reason for the specific route used for the real Cannonball Run? Our roads are a true modern convenience that we clearly take for granted and assume to be a right, not a privilege. I have a new appreciation from trying to track down the answer to one simple question. Sometimes it takes a good origin story to change our perspective. 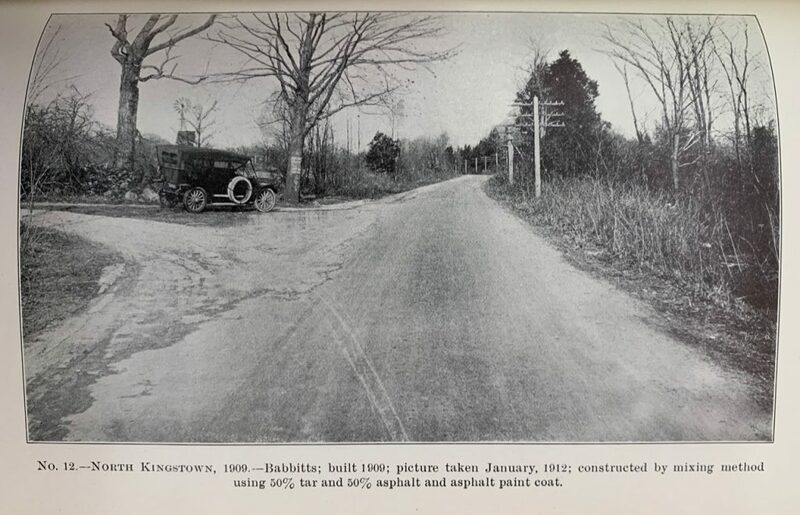 Special thanks to Charles St. Martin at the RI Department of Transportation and the staff of the RI State Archives for their help tracking down the early 1900’s RI Department of Public Roads annual report information that was critical to answering this question.